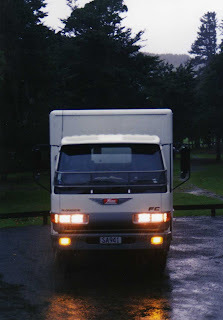 The Road Ranger Blog: The Trucks I Have Driven. Although I have a Class 5 licence (heavy vehicle with a GCW of more than 25,000kg) all my driving jobs have been in Class 2 rigids (less than 18,001kg). Here are the trucks I have driven regularly, though there have been times I have driven other trucks for one day or even for a few minutes. 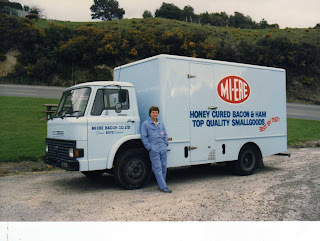 I started my truck driving career with Mi-ere Bacon Co in 1987 in this 1981 D series Ford. In the beginning it had a 2 speed axle from a Thames Trader, but when this became troublesome it was re-equipped with a single speed item. My job was to service and deliver into the Hutt Valley area, so this meant a trip each way over the Rimutaka Hill Road every day. The Ford could race over then in 3rd gear (4 speed box) all the way. Unfortunately it was flat out at 80km/h on the flat. With a wider front track than the equivalent Japanese trucks of that time, and the fridge motor mounted below the body, it was very stable and could keep up with most cars through corners. The fridge motor was very noisy and it needed to be left running all day in the Summer. If you were in the back unloading for too long it would start to give you a headache. Thats me proudly posing with the old girl, with a "mop" of hair and stubble on my chin. Nowadays the stubble is all I can grow on the top of my head. 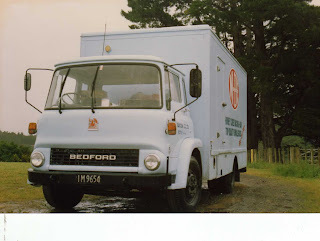 Sometimes if the Ford was in need of repair I would drive this 1977 TK Bedford. The TK with it's low top edge to the windscreen and it's slightly odd driving position felt a bit outdated compared to the Ford, but it had a more comfortable seat and I liked it. 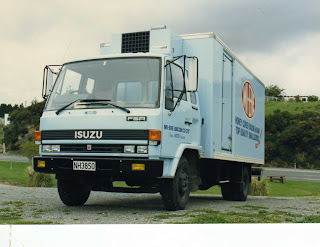 Soon I was promoted to this 1987 Isuzu FSR which had a 6 speed box with a round-the-corner shift from 5th to 6th. 6th was very high geared and needed to be swapped for 5th, or lower, the moment it saw a hill. Not a bad truck, but the seat always gave me a sore back. In 1991 the company which had purchased Mi-ere closed the factory and I became redundant. Within a month a private individual had bought the factory and some of the equipment and started as Premiere Bacon Co in opposition to Mi-ere and it's associated companies. I was re-employed servicing the same area as before and using this 1982 Isuzu JCR with 5 speed box and 2 speed axle. It was a very challenging job and I am proud to have been one of the staff who built up sales and helped Premiere become the company it is today. The Isuzu was a bit too big for the job although it was a good reliable truck. In those days we serviced a lot of shops down narrow alleyways and it could be a bit of a mission getting this beast in and out. I also found the first step into the cab awfully high off the ground. 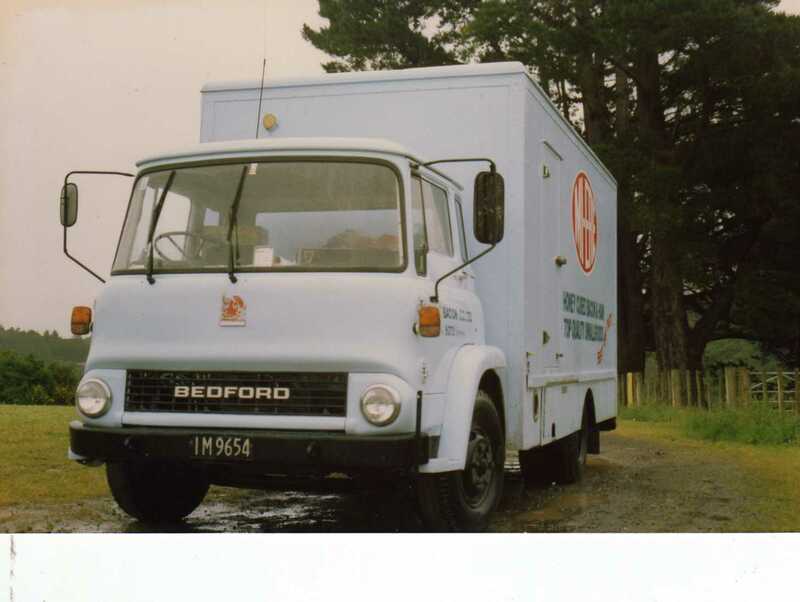 When my boss suggested he get me a smaller truck, I said I would be happy to drive the old Ford (it was now our spare ) if only it had power steering. Power steering was fitted and here it is in our new colour scheme. This became necessary as Mi-ere had objected to our trucks being painted in a similar livery to theirs. As the company grew I got my first brand new truck. This Hino FC. Unfortunately to save money the body off the old Ford was fitted to it. Although more powerful than the Ford it had a nasty gap between 3rd and 4th which made the hill work a bit of a challenge and also another uncomfortable drver's seat.. 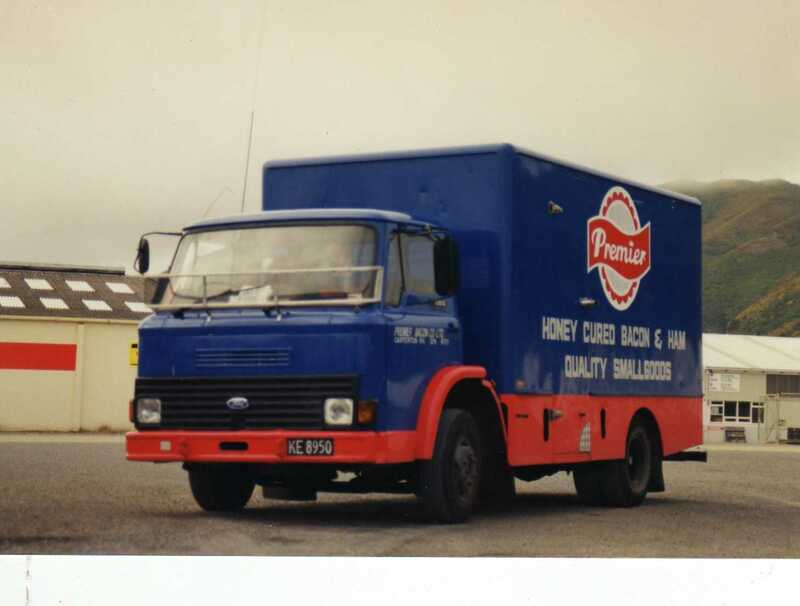 The "new" paint scheme in that dark blue had proved to be a bit of a struggle for the fridge motors in hot weather so the management chose to leave the new trucks in plain white. I objected to this strongly as I believe all truck body sides are billboards just waiting for sign-writing. 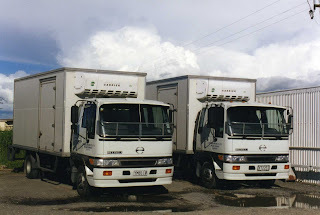 In 1999 the company was really starting to grow and bigger trucks became necessary. Again we got new trucks (Hino FDs), but this time with new bodies as well. I really appreciated the thoughtfulness of our manager at that time who sat us down with the body builder and said "You are the guys who have to work out of them so tell him what you need". 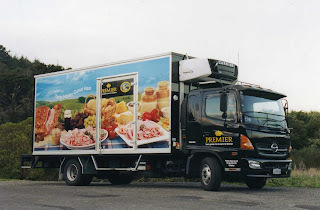 We had always worked off shelves each side with a central aisle previously, but with bigger orders to be supplied we designed these trucks with shelves accessible from the back door, but with side doors near the front so we could carry 2 pallets. These were really good trucks with 6 speeds and a comfortable driver's seat with adjustable lumbar support. 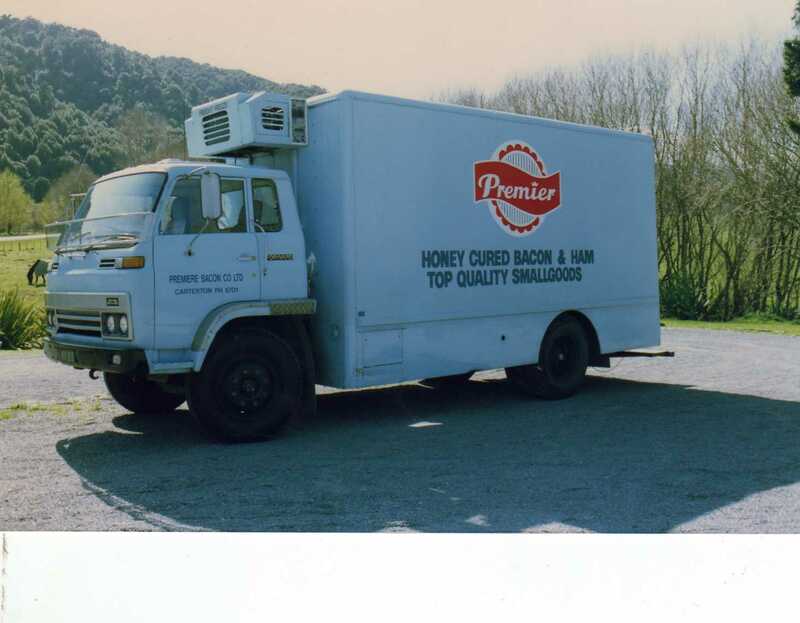 The fridge unit was driven from the motor like an oversized air-conditioning unit. As long as the motor was running it switched in and out to keep the product at optimum temperature. But unfortunately the management refused to signwrite them once more. Eventually I sent our CEO an e-mail informing him that I knew where there were a number of billboards he could have for free apart from the initial signwriting cost. Anything free always goes down well with management and he was soon in contact. Of course I was referring to the mobile billboard on each side of each of our trucks. In 2004 we again received new trucks, this time with superb signwriting which I like to believe was instigated by my comments. 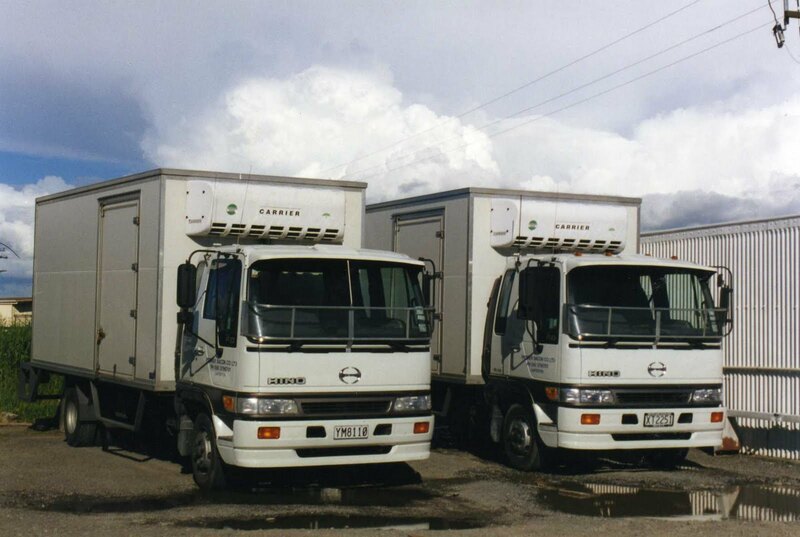 These were Hino FDs with turbo intercooled motors, air suspension, air ride seat and air conditioning. I loved the power of the engine and the fridge unit (which was now a completely separate unit with it's own motor which started and stopped itself), but I actually preferred the layout of the cab of the previous model. In 2006 the company decided that it would be more beneficial to "farm" out freighting to an outside trucking company and my truck driving job came to an end. 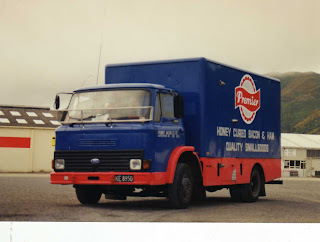 I then became a sales rep for Premiere with a company car, but I was never as comfortable in this job as I had been with the truck driving position.